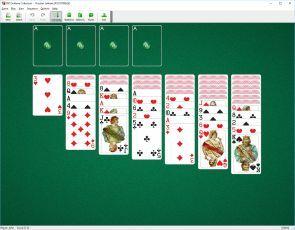 Russian Solitaire is a variation of Yukon Solitaire. In contrast to Yukon, the tableau is built down in suit rather than by alternate color. This difference makes this game more challenging and harder to win. BVS Solitaire Collection 8.1 for Windows XP/7/8/10 includes Russian Solitaire and 5 other similar games, along with other popular solitaire variations. Buy BVS Solitaire Collection now to play 520 solitaire games (including Russian Solitaire). You will receive your registration code within a few minutes. You will also get Plus Pack with excellent additional card sets, card backs and backgrounds. Only $19.95 USD.